The First World War has always held a certain grim fascination – its sheer magnitude, the horrific casualties, the bravery, the patriotism, the amazing logistical challenges and the speed of mobilisation. It was a War that need not have happened. A War with an unsatisfactory conclusion that directly lead to even greater carnage of The Second World War. These War Diaries provide fascinating insights for anyone wishing to undertake research. They tell the story of Surrey’s infantry Regiments. During the Great War the Queen’s raised 31 battalions and 29 Young Soldiers and Labour units. 23 battalions saw active service. The East Surreys raised 24 battalions, 21 saw active service. The casualties were horrendous; the Queen’s lost 7399 Officers, NCOs and men killed. The Surreys had 6223 officers and rank and file killed. In addition eight battalions of The London Regiment who wore The Queen’s or East Surrey cap badge. Each battalion was about 1,000 strong. On studying these diaries one soon finds inconsistencies of style or detail. Sometimes they could only be written well after an engagement because the previous officer responsible for writing them up had been killed or wounded. The confusion and chaos of battle, together with the high number of casualties, often made it impossible to determine who had been killed, wounded, taken prisoner or “Missing in Action”. Wives and mothers must have dreaded the Telegram boy approach to bring bad news. The toll of casualties was continuous throughout the four years of conflict. Of the 1,000 men of 1st Battalion The Queen’s Royal Regiment who landed in France in 1914 only 17 were alive at the Armistice. The 2nd Battalion The East Surrey Regiment who returned from India during 1914 and who first went up the line in 1915. Of the 1,000 who went up to the line only 200 survived in just 5 days of action. 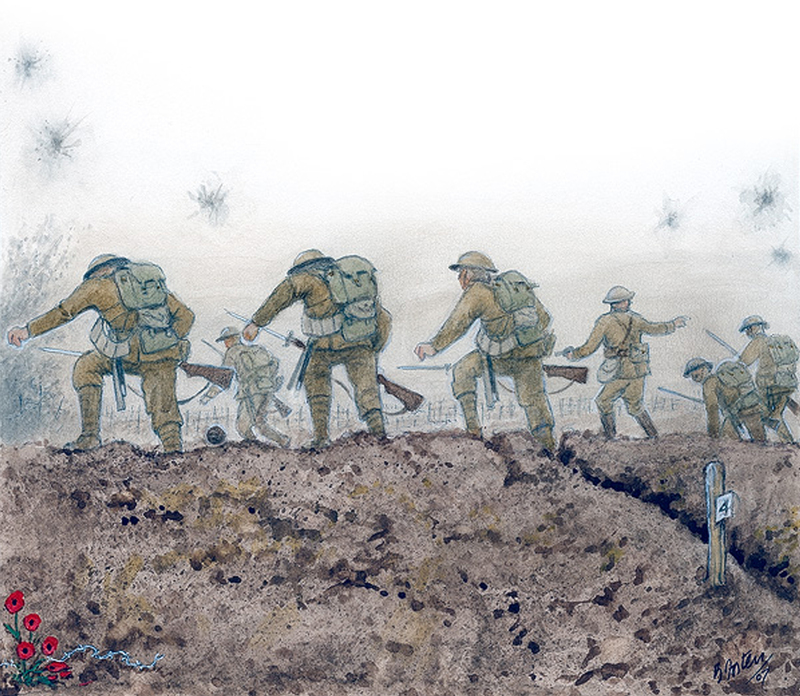 These diaries are dedicated to the 8,000 men of The Queen’s Royal Regiment (West Surrey) and 6,000 men of The East Surrey Regiment many of whose bodies lie in Flanders. Their names are found on The War Memorials in the towns and villages of Surrey and South London and in the Books of Remembrance held in the Regimental Chapels at Holy Trinity, Guildford and All Saints, Kingston upon Thames. It is important for the viewer to understand that the diaries are only for the units for which we have copies.